Pound Cakes have universal appeal. This Lemon Frosted Lemon Cake is one of my favorite pound cakes. It is a sweet and buttery cake with a moist yet dense texture. As its name implies, it has a tangy lemon flavor that comes from adding both lemon zest (outer yellow skin of lemon) and lemon juice to the cake batter. 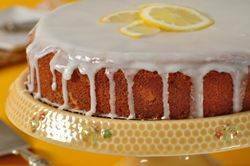 To further enhance the lemon flavor, the cake is frosted with a simple lemon glaze (frosting). This frosting is made by combining powdered sugar with freshly squeezed lemon juice and what I like about it is how it dries to a hard and crusty glaze. A lovely cake on its own with a hot cup of tea, or you could serve it with fresh fruit. Recipes for this lemon cake are often found in English cookbooks. Arabella Boxer has a recipe and talks about this cake in her wonderful book Arabella Boxer's Book of English Food which is about British foods served before WWII. Another similar recipe can be found in Jane Pettigrew's The National Trust Book of Tea-Time Recipes which pays tribute to present day tea rooms in the United Kingdom. And the late English food writer, Jane Grigson, has a recipe in her excellent book Jane Grigson's Fruit Book. This book covers a wide range of fruits, and besides recipes, she gives us a little history on each fruit. When you make this Lemon Cake, always use lemons that are fragrant with brightly colored oily yellow skins. If you can, use organic lemons. The best lemons are firm, plump, and heavy for their size. Don't use lemons that have blemishes, soft spots, or are hard and wrinkled. Lemons consist of a yellow outer rind (skin) and this is where most of the lemon's wonderful tangy flavor is located. Before removing the outer rind (zest) make sure you wash the lemon thoroughly (soap and water is best). And when removing the zest do not remove the white membrane (pith) that is underneath as it is very bitter tasting. If you like, you can make this cake into a Lemon Poppyseed Cake by adding about 2 to 3 tablespoons of poppy seeds to the batter. Or as Jane Grigson suggests in her recipe, you could even add about 1/3 cup (80 ml) of chopped candied lemon peel to the batter. As a side note, you could make this Lemon Cake into an Orange Cake simply by replacing the lemon juice and zest with orange juice and zest. Or, if you did not want this cake to have a citrus flavor, you could use 1/4 cup (60 ml) of milk instead of the lemon juice. Once the cake is baked and slightly cooled, a lemon glaze (frosting) is poured over the top of the cake and allowed to drip down the sides. I like to pour the glaze over the cake while it is still warm so some of the glaze soaks into the cake. And I also like how the frosting dries to a hard and crusty glaze that gives the cake a delightful crunch. Lemon Cake: Preheat oven to 350 degrees F (180 degrees C) and place oven rack in the center of the oven. Butter, or spray with a non stick cooking spray, a 9 inch (23 cm) spring form pan and then line the bottom of the pan with parchment or wax paper. Sift or whisk together the flour, baking powder, salt, and lemon zest. Add the flour mixture (in three additions) alternately with the lemon juice (in two additions), mixing until you have a smooth batter. Pour the batter into the prepared pan, smoothing the top with the back of a spoon or an offset spatula. Bake about 40 - 50 minutes, or until a toothpick inserted in the center comes out clean. (Do not over bake or the cake will be dry.) Place on a wire rack to cool for about 15 minutes, then gently remove the sides and bottom of the pan. Lemon Frosting: Place the sifted confectioners sugar in a small bowl. Add 2 tablespoons lemon juice and stir until you have a thick and smooth glaze. Add more lemon juice or powdered sugar, as needed. Pour the frosting over the top of the cake, allowing it to drip down the sides. Let the frosting dry before covering and storing. This cake will keep for several days in an airtight container. Boxer, Arabella. Arabella Boxer's Book of English Food. Penguin Books Ltd. London: 1993. Grigson, Jane. 'Jane Grigson's Fruit Book.' Penguin Books. London: 2000. Pettigrew, Jane. The National Trust Book of Tea-Time Recipes. Trafalgar Square. London: 1991.